Before 1824 the whole area now known as Boldmere was a featureless expanse of gorse, heather and grass, common land where countless sheep grazed. When Sutton commons were enclosed in 1825 and the land was parcelled out to private owners it was bad news for the sheep as the new owners set about improving the land on their new holdings. Hedges were planted, roads laid out, drainage improved and the land was deep-ploughed. Some of the plots of land awarded to the private owners were very small - less than an acre - hardly worth the expense of improvement. In Boldmere the stretch of the newly-laid out road between Jockey road and Highbridge Road was lined with small plots on one side, and it was here that the first new houses sprang up. Many hands were required to bring the land into cultivation, and most of the new houses built at Boldmere in the 1820s and 30s were for agricultural labourers. Booths Farm stood at the junction of Halton Road and Darnick Road, and it was the farmer there, John Buggins, who undertook most of the work of cultivating the former commons at Boldmere, bringing in an army of farm workers, many of them from Ireland. In 1839 Buggins, himself a Catholic, sold a piece of land next to the Sutton Park Hotel to the Roman Catholic Church, and St. Nicholas Roman Catholic Chapel was built in 1840. By 1845 the stretch of Boldmere Road between Jockey Road and Highbridge Road was built up on one side (the other side was farmland). Members of this new community not employed on the land were either workers at the nearby spade factory at Powell’s Pool Mill or working at home as carpenters or other trades; if you asked them where they lived, they would have said “on the Coldfield”. The next few years brought an infants school and St. Michael’s Church, the district was renamed Boldmere, Highbridge Road was laid out, and the gradual transformation of the rural backwater into the thriving suburb began. 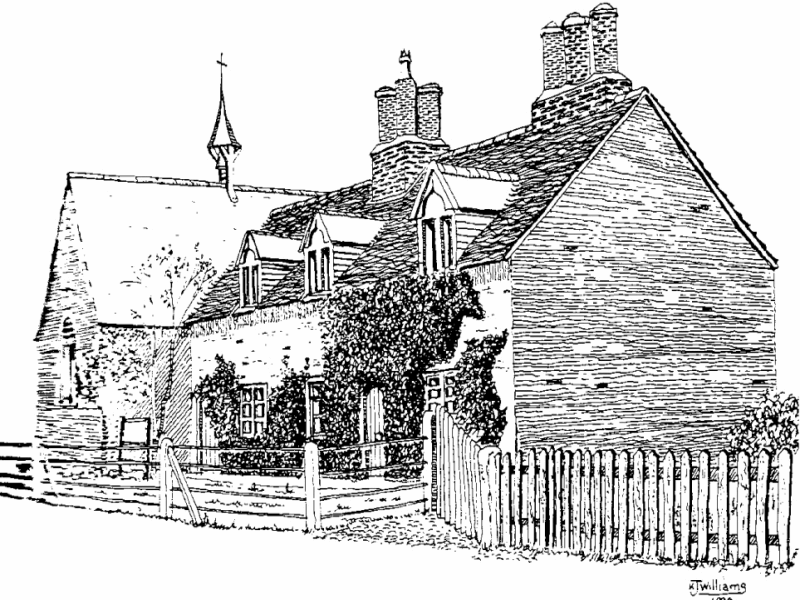 Chapel of St. Nicholas, Boldmere, and adjoining cottages, sketched by the late Ken Williams.